Holy Toledo! What Are They Doing Out There? Home › Kram's Korner - From the Club Level › Holy Toledo! What Are They Doing Out There? It seems the whole “Bacon USA” theme is catching on! Even the Toledo MudHens are getting involved. On Thursday August 6, the MudHens will have a jersey auction night with an “Egg” design. Why? 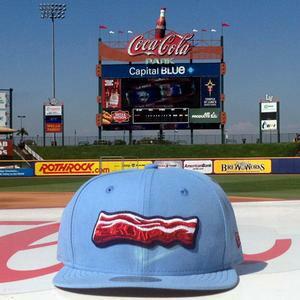 Well, it’s “Bacon and Eggs” night, and they’ll be hosting the IronPigs who have agreed to wear the “Saturday” Bacon ensemble for that game! If they have “remote bidding” perhaps we should get involved if we know any players on the MudHens at that time. Also notable on the Toledo web site: They will open with a double-header on April 16. That’s kinda weird to choose to do a 2×7 inning game early in the season when you’ll already need a few of them just to make up for the weather-related problems. Perhaps it’s designed to get them an extra day off later on. They’ll have a “Beer Bash” that starts at 3PM, followed by the two games at 4PM; it does sound like fun. I also noticed that they are cross-promoting with the ECHL Toledo Walleye, who may be hosting a playoff game that night. Beer bash, baseball double-header, then hockey? Golly, don’t expect Toledo sports fans to make it to work on Friday the 17th! With all this MudHen craziness, I’d be remiss if I didn’t remind you that Toledo is the old stomping ground of our very own GM, Kurt Landes! Perhaps they will raise a “Toast” to team spirit? I think you may have just invented a new Pork Racer? I don’t know. I can’t decide. I guess I’m just waffling. Waffling,… could just be trying to syrup some controversy. All International League teams are created equal, but IronPigs are more equal than Mud Hens … Bring on the Battle of the Barnyard! From this description provided by the team in 2010, they look more like… ducks. Swamps, where they are likely to be found, can be muddy. I love this American game of baseball. And, after all those years behind the Iron Curtain, exactly who else am I supposed to be rooting for? Many people might be tempted to say, “Cincinnati Reds” or “Boston Red Sox”. But I am so much more of an International guy, myself. See you at the Park in the spring, tovarishch!